The MS Experience, Issue #0409 -- Better Late Than Never! We apologize for the lateness of this issue, but we are glad to be able to bring it to you. We would rather spend time doing it right and making it the best it can be, than to throw together something that won't reflect the quality that you have come to expect. So, here's what you'll find in this issue. We are including an article by Christine Steendahl. It is about how to make a healthy eating plan. I've included two more recipes as well. You'll also find spring cleaning tips and tips on how to use aromatherapy to compliment your other therapies and medications. We've included another Cartoon of the Month! Everyone loves a good laugh. And MSers are no exception. 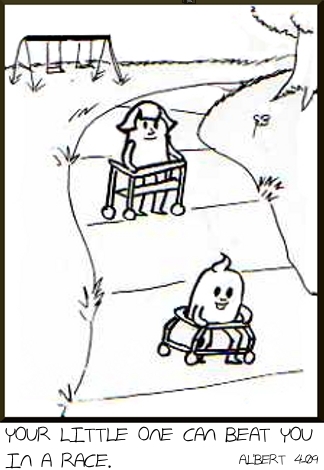 When you have a chronic illness like MS, everyday has situations that can be funny - most times after the fact. Laughing usually helps to relieve stress which as I've said before, is something to be avoided at all costs by MSers. We still hope to include a short Video of the Month next month, as well as an Exercise of the Month. You are welcome to share this newsletter with your friends and family. And if someone shared this newsletter with you, be sure to subscribe now so you won't miss a single upcoming issue. So, grab a cup of your favorite beverage. Go ahead, we'll wait. Have a seat, get comfortable, relax, and enjoy! First of all, here's a great article I found about making a healthy eating plan. It's by Christine Steendahl, owner of Healthy Menu Mailer. Hope you enjoy it. Once you get in the swing of things and find healthy foods that you truly enjoy sticking to a healthy eating plan isn't very hard...provided you do it right and don't fall in one of the few traps that seem to get most people to give up on their healthy eating efforts. The key to healthy eating is to find ways to insure you are eating foods that are good for you until it becomes a habit or a new way of life for you. One great way to do this is to let family and friends know about your plans and ask them to check in with you every once in a while. Positive encouragement from loved ones and knowing that they will hold you accountable is a great way to motivate yourself to keep going and stick to your plan. Put your healthy eating plan on paper. Sure that may sound a little simplistic and you may have a pretty good idea of what you are doing in you head. But it's not the same as writing it all down and having it in front of you. It's much easier to cheat yourself into thinking that carrot cake with cream cheese frosting is a health food when you don't have a healthy meal plan written out. Get out a piece of paper or even better, grab your free meal planning basics report and meal planning worksheets at Healthy Menu Mailer - Free Sample and write down what healthy foods and dishes you are going to enjoy this week. Speaking of enjoying food. Try new healthy foods like a vegetable you've never had or a new recipe on a regular basis. Sooner or later you are bound to find some things that you absolutely love that are also good for you. And don't completely cut out your old favorites either. If you can't live without a bacon cheese burger then don't... instead enjoy it in moderation like maybe once a week or once every few weeks. Make an effort to eat healthy foods the rest of the day and maybe take a walk to burn of a few of those calories. The point is that you don't have to live without those favorites. You just don't want to eat them all the time. But don't feel guilty when you do indulge yourself. In fact, you may want to make them a regular part of your meal plan. I really like the "dump" recipes. They're so quick and easy. You can put all the ingredients in a freezer bag. Put it in the freezer where it marinates. When you're ready to cook, pull it out and put it in a casserole dish or the crockpot in the morning (even better). Everything about it is so easy. And now for the recipe, (well maybe two this time...). Note: OAMC = Once-a-month-cooking. If you haven't heard about this, it's also a great time-saver. You do need a bit of stamina, or a lot of help, on cooking day. The idea is to pick one day out of the month to cook all of your meals for that month. It takes quite a bit of pre-planning. You need to research and plan all of your meals for the month. Then you need to make up a grocery list for all of the ingredients for each of your recipes. And then you need to plan a day to shop - usually a day or two before you actually cook. Once you've done it a few times it gets easier,...but as you can see it's a little involved. The rewards are really worth the effort, though. You get 30 meals that are already pre-cooked or ready to cook as with the dump recipes. As a person with MS, you may not be able to handle a project this size due to fatigue or weakness. Your best bet would be to delegate this project to family and friends who are willing to do all or most of the work for you. Your family will love it and you will benefit greatly from a months worth of meals that are nutritious and easy to prepare. Anyone will be able to follow the directions on the recipe when you aren't up to it. Okay, back to the recipe. And if you'd like to to find out more about OAMC, click here. (Clicking link will open a new window). 1 - For immediate cooking: Pre-heat oven to 350°F Place all ingredients into a large baking dish, turn chicken to coat. 2 - Bake until chicken juices run clear (45-60 minutes for chicken pieces, or 20-30 minutes for chicken breasts). 3 - For freezing: Place all ingredients into a 1 Gallon freezer bag. 4 - Lay flat in freezer. 5 - To thaw and cook: Take the bag out of the freezer the night before, make sure the baggie is completely closed. 6 - Place the Bag on a refrigerator shelf to thaw. (If you can freeze the bag in the shape of the pan you will cook it in, you can thawing it right in the pan before placing it in the oven). 7 - Preheat the oven to 350°F Empty the contents of the bag into a large baking dish and bake until the juices run clear (45-60 minutes for chicken pieces, or 20-30 minutes for chicken breasts). And now for the next recipe. I love Bar-B-Q and I love honey, so this appealed to me right away. Add a salad and some bread and you're good to go! 1 - For immediate cooking: Pre-heat oven to 350°F Place all ingredients into a large baking dish, turn chicken to coat. Bake until chicken juices run clear (45-60 minutes for chicken pieces, or 20-30 minutes for chicken breasts). 2 - For freezing: Place all ingredients into a 1 Gallon freezer bag. Lay flat in freezer. 3 - To thaw and cook: Take the bag out of the freezer the night before, make sure the bag is sealed completely. 4 - For the oven: Preheat the oven to 350°F Empty the contents of the bag into a large baking dish and bake until the juices run clear (45-60 minutes for chicken pieces, or 20-30 minutes for chicken breasts). 5 - For the crockpot: cook on low for 6-8 hours or on high for 4-6 or until done. 6 - On the grill: cook over medium heat until juices run clear. Be sure to watch carefullly or these will burn! I really love flowers. The variety and the intricacy of each design is so mind-boggling. They never cease to amaze me. 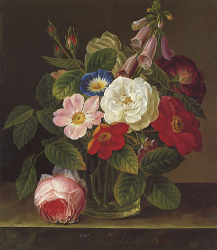 This is a beautiful floral painting - a still life by Gottfried Wilhelm Völcker (1775-1849). I also found a quote that I think fits nicely with the painting. Even though the painting is of more than one flower, each one tells a different story. Each flower is a miracle in itself, just as each persons life is. "If we could see the miracle of a single flower clearly, our whole life would change". First of all here are some spring cleaning tips for you - I hope you enjoy them. Every year around this time, I can use all the help I can get. Especially when it comes to organizing and cleaning out the clutter that has accumulated over the winter months. So if you're a procrastinator like I can be at times, maybe these tips will help motivate you. (They have me). This months tip is about alternative therapies. I've been thinking about aromatherapy after reading a fellow caregivers MS blog. He talked about how he uses certain scents to help his wife to feel better. So I've been on a quest to search out the meanings of different scents as a healthy alternative and compliment to the medications you take. Here is a list of aromas you can use to create different "moods" in your home. One of the best ways of getting the best benefit from aromatherapy is by using essential oils. Tons of botanical materials are gathered from the earth's flowers, plants, trees, grasses, and roots. Once they are harvested, they are distilled to produce the essential oils. These oils are sometimes called volatile or ethereal oils. They are essential because they carry the distinctive scents or essence of the plant. Besides oils, there are many ways to enjoy the therapeutic benefits. The oils can be added to soaps, lotions, ointments, salves, and lip balms. They can be used for massage, bath, candles, inhales, room and body perfume, hair shampoo, facial and skin care. Here are a few essential oils which may specifically be helpful for problems MSers face on a daily basis. Neroli oil has been known to help neuro-muscular problems. Rosemary is a neuro-muscular relaxant. Hypericum (St Johns Wort) is good for MS. It also blends well with other oils because it doesn't have a strong aroma. Black Pepper may be used for constipation. It is gentle and can aid in peristalsis (the wave-like contractions that move food along the digestive tract). Juniper is an oil with gentle diuretic properties. It can be used to stimulate the urinary system and help reduce water retention. Roman Chamomile has relaxant and sleep-aiding properties. If you have disturbed sleep patterns, this may help. Green apple can reduce headaches. The scent may affect pain pathways in the brain. Grapefruit oil is uplifting as well as a digestive aid. It can improve your appetite, as well as help with depression. This is only the tip of the iceberg for the uses of aromatherapy. But the thing to realize is that essential oils will not cure any disease or condition. They are a complimentary or alternative medication or CAM. Use these along with your other therapies. And if you have any questions about how to make the recipes you find, or if something is safe, you can always talk to your doctor, or find someone who specializes in aroma therapy. This months book is by Amelia Davis. 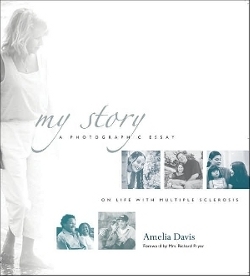 "My Story" - "A Photographic Essay on Life with Multiple Sclerosis"
Amelia Davis is a photographer who has taken pictures of people who live with MS. You see some of them in their wheelchairs. All of them doing the things they do in their everyday lives with multiple sclerosis. Included in the book are 32 essays written by MSers, including Richard Pryor. In fact the forward is by Richard Pryor's wife. Here is a little excerpt from it. You get a birds eye view into the lives of people from all walks of life. Each with the common thread of MS running through their lives. I'm sure that you will enjoy reading their stories and that you will find many who you can relate to. I like this part of the news letter and really hope you enjoy it as well. My 15 year old daughter, also helped me with this month's drawing. She's quite an artist and hopefully I can get her to add some of her pieces. If you are new to Life in Spite of MS, she did the little profile picture on our home page. And before I forget, if you'd be interested in adding your art, poetry, or writing, in a room of your own, check out Life in Spite of MS~Space. There you can add your pictures, writing, whether it's poetry, short stories, advice, or just your thoughts about MS.
We hope you enjoyed the fourth issue of The MS Experience. And again, you are welcome to share it with others who you feel may be interested or send them to The MS Experience to subscribe. The videos are still a work in progress and we have several other things, including a contest, in the works. So check back often and look for the newsletter toward the end of next month. See you then!